Audience: Middle school age. This book is part of a series entitled Women of Achievement which examines the lives of influential women of the 21st century and throughout history. Summary: Janet Hubbard-Brown portrays the life of the teenage girl of 15th century France who overcame huge obstacles to become not only a military leader, but also a confidante of the newly crowned King Charles VII. This book follows Joan’s life from an early age when it is thought she began to hear voices of the saints that lead her on her ultimate quest to rid France of the English army. The author not only highlights Joan’s incredible struggles and achievements, but also develops the historical context in which Joan finds herself. The engaging story of Joan’s life is told objectively. In the hand of Hubbard-Brown, Joan’s life has its shining moments along with the bumps along the way. Toward the end of the book, the reader is presented with a treat. The author has provided a list of “Further Resources” including print materials and web sites. Literary elements at work in the story: The crisp writing style is appropriate for a story of Joan of Arc. The author is careful to not romanticize the life of this extraordinary young woman. While Joan is portrayed in a favorable and often sympathetic manner, this is not a depiction of the idealized national hero of France. The reader sees a woman millions have revered as the “morally perfect” Lily of France as well as the defiant and mysterious woman characterized in William Shakespeare’s Henry VI as a witch. This book is framed within the appropriate political, cultural and historical settings. Included with this biography is brief overview of the canonization process and how it has changed in over the years. I should imagine adolescents of the 21st century brought up in a faith tradition outside of the Catholic Church would find this helpful also. (How) does the perspective on gender/race/culture/economics/ability make a difference to the story? The story of Joan of Arc will not resonate the same to 21st century teen girls living in the United States as it may have to French teen girls of the early 20th century. Teens today are accustomed to seeing celebrities of their own age. The author does an excellent job describing the society and culture into which Joan was born. Theological conversation partners: A biography of a Christian martyr can be a wonderful teaching tool in a PC(USA) church setting, or in any church. I would begin this lesson with a brief overview of the canonization process in the Catholic Church and an open discussion of other well known saints to measure the class’s awareness or knowledge of other historical figures/saints. Joan’s story is endlessly fascinating. The voices she claims to have heard are teaching points. Who are these individuals? Mini-lectures can spin out of this: who were the saints Michael, Margaret and Catherine? Additionally, a discussion of why, we as Presbyterians reject “Saints” in favor of “saints” (sola scriptura) could occur. My fictional class is called “Understanding Faith through Christian traditions.” This fictional class is comprised of adolescent boys and girls. The scope of the class is broad. It traces early church history, meets and greets several young heroes of faith, such as Joan of Arc, Francis of Assisi, Mother Teresa and others. For this particular unit, I would pair the reading of biographies of Joan and Mother Teresa. Discuss the lives of the saints and the process of canonization. Ask if the steps to canonization were easier for Mother Teresa or for Joan? Why? Ask learners to compare and contrast cultural, societal and other differences between Joan and Mother Teresa. Ask what is different in the Catholic Church during their lifetimes? Why, in your opinion, is one person more of a saint than any other (Ephesians 4:12)? How can we use our personal faith when trying to overcome obstacles? How might you try to recognize God’s call to you? FOR GIRLS ONLY: Do you see yourself as Joan, a young woman in a man’s world? The author Hubbard- Brown proactively poses questions that could illicit discussions relating to roles women play in history, overcoming obstacles, transgender issues, mental illness, and most importantly- are you prepared to die for your faith? 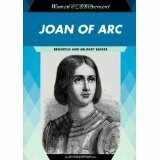 Joan of Arc: Religious and Military Leader by Storypath is licensed under a Creative Commons Attribution-NonCommercial 4.0 International License.